This two bedroom cottage offers comfort and charm with an unbeatable location! Our Storybook Cottage offers an eat-in kitchen with all the appliances, cookware and dishes you need to cook up your families favorite meal-the only thing you provide is the food! Our living room has a pull-out couch (sleeps 2), a woodstove (wood provided), flat screen TV, and a slider door to enjoy our outdoor view. Our two bedrooms sleep 5-one double and three twins-new beds were purchased in 2016- (our guests bring their own linens and towels). Our bath has a shower and a tub! Our entire cozy cottage was remodeled three years ago! On the outside we offer a covered porch, a gas grill, and a picnic table.Our association has an open field with a running brook. This is where memories are made! Right up the street is Jackson Village-considered "the quintessential town of New England"! Pass thru the historic Jackson Bridge and you will begin to appreciate all this small town has to offer. Right along side of our cottage. with wood provided for our guests. Kitchen Table with an extra leaf to accommodate six comfortably. We now have High Definition with 70+channels!!!! and a VHS player available in second bedroom. located across the street in Nordic Village! Lots of classic VHS movies. There is a covered deck with a small table and two chairs. There are also two benches-one on each side of our sliding glass door. Courts available at Nordic Village! Nice cabin. Wood stove, Full kitchen are nice. No linens, towels, dish towels, or paper towels. We arrived to find very limited toilet paper. Don't worry, we stocked up for the next guest. Would be 5 stars but you know....toilet paper is kind of essential. The cottage was perfect for our 5 day ski trip. Only 35 minutes from Bretton Woods, 15 minutes to Wildcat and 10 minutes to Attitash. We even visited Loon for a day and it was about 50 minutes away. My favorite ❤️ restaurant, The Red Fox, was only 5 minutes up the road. We bought firewood every night and had a nice fire in the wood stove - what a nice way to end your day (of course with your favorite beverage). I would definitely recommend this little jewel for your next ski vacation. We'll be booking again! Has everything you need . Cute and cozy cottage. Nice weekend away with my daughters. The property is extremely cozy, well kept and clean. We love The Nestle Inn as well as it’s neighbor The S’Mores Inn. We’ve stayed in both countless times. Our favorite tends to be The Nestle Inn due to its coziness and wood stove vs. fireplace. If there was one draw back it was that there wasn’t any kindling wood, paper, lighter or matches to actually start the wood stove. We made due and bought the things we needed to get that stove going! All in all it was a wonderful long weekend and we will continue to return! OUR COTTAGE is an adorable vacation getaway loaded with comfort and charm. The cottage sleeps 5-7 guests. STORYLAND is conveniently only two minutes down the road. Numerous STREAMS, WATERFALLS, and natural SWIMMING AREAS are found throughout the area. The best HIKING TRAILS that offer unbeatable views can be found at almost every turn. KAYAKING and CANOEING can be enjoyed along the Saco River. The famous NORTH CONWAY OUTLET STORES are only 15 minutes away. ECHO LAKE, which is also located in North Conway, provides a picturesque setting for great swimming and beaching. The kids love to bring their rafts. FISHING spots are abundant along the rivers and streams. Golfers can enjoy the beautiful GOLF COURSE which is right up the street in Jackson. JACKSON NH is known as the quintessential New England Town. You will discover this as soon as you enter the famous covered bridge. Best CROSS-COUNTRY ski trails in New England! SANTAS VILLAGE and SIX GUN CITY are other family attractions that are within 45 minutes of our cottage. OUR AMENITIES: We are afforded the use of the following fabulous amenities which are located at Nordic Village...right across the street from our association! A STEAM and SAUNA ROOM. A GAME ROOM with a center fireplace and activities such as ping pong, pool and arcade games. NIGHTLY BONFIRES . . ...perfect for toasting marshmallows and making S'mores. . ..the kind of old-fashion fun we all remember as a kid. FAMILY ENTERTAINMENT is provided every evening in the summer and during holiday periods! A TENNIS COURT and BASKETBALL COURT are also available. As well as A PLAYGROUND! 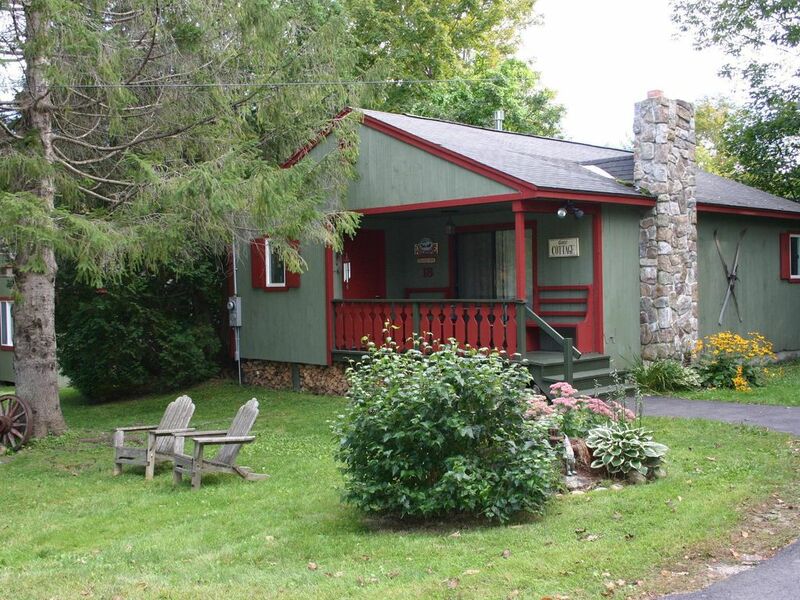 A $200.00 refundable reservation/security deposit is due when reserving Our Storybook Cottage. Also, our guests provide their own bedroom and bathroom linens. We have available plenty of blankets and pillows.